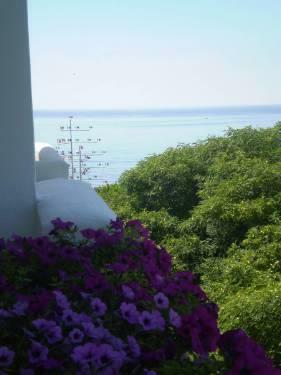 FREE WI-FI!Wonderful SUNNY apartment.Beautyful SEAVIEWS, 100m from BEACH,infront of Paloma Park, POOL/ 100m fra strand. BENALMADENAS ACTIVITIES: The apartment has got the best situation: ONLY 100 M FROM A 2 KM LONG BEACH (beach Santa Ana, Arroyo de la miel) that has got all necessary for the tourist as renting of : waterbike, kayac, sunbeds and parasols. The beach ends in BENALMADENA PORT that is well known for its latin atmosphere with all its restaurants, bars, discos, shops and boattrips. An AMAZING GOLF COAST with the known TORREQUEBRADA GOLF COURSE only 3 km from the apartment and you have 6 other golf courses in a shorter distance than 10 km. CASINO only 2 km away. ALL KIND OF ENTERTAINMENT IN BENALMADENA: - TIVOLI AMUSEMENT PARK open all year with concerts in summertime. - SELWO DOLPHIN- AND PENGUIN-PARK; just on the opposite side of the Paloma Park you can have a special experience seeing a show with sea lions and dolphins and where you can even have a photo while you swim with the dolphins. Inside they have a cafeteria, a restaurant and a really good playground. - CABLE CAR; the only one on the Costa del Sol that takes you up to the top of the mountain with incredible views all over the coast from malaga to Fuengirola. Here you can enjoy an eagleshow, riding a donkey or if you prefer it, just enjoing the views with a cup of coffee. THE PALOMA PARK (entrance just across the street) is a wonderful place where you can walk around the lake seing animals like swans, pelicans and ducks or you can have a walk escorted by the rabbits, gooses and peacocks as they live in freedom. Or you can go and speak to the goats, the ostriches or to the bambies. The park has got 2 playgrounds with swings and many other things. One of them is for the smallest children and next to it you have a cafeteria where you can chose to sit inside or outside. The Paloma Park is one of Benalmadenas proudness and the ENTRENCE IS FREE. Only 5 km away we have a CROCODILE PARK and next to that we have a great WATER LAND " AQUALAND". It is very big and has all kind of slides (high/low, quick/slow) for small children and others for the biggest children. Here you can rent boxes for you private belongings and also sunbeds although there a lot of garden where you can put your towels while you are enjoying yourself. It is allowed to bring your own picnic. - 8 km away a FABULOUS ZOO, in Fuengirola, BIOPARC. Only 1500 meters from the DOCTOR HOUSE ( 24 hours) and 3 km from the international hospital and next to that the public hospital.